Xiaomi’s 12.5-inch Mi Notebook Air appears to be due for an update in a few days, as evidenced by a post from the official account of the company’s notebook division. The post is about as vague as they come but there’s a date – March 26 is when something is happening. There’s a scale in the teaser image showing 1.07kg, the weight of the current model of the laptop. 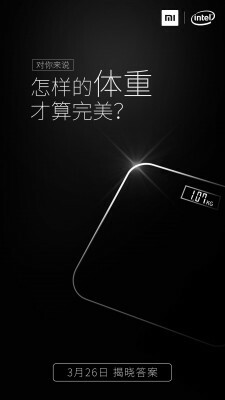 Our Chinese being rusty, and Google Translate being notoriously unreliable with Chinese to English translations, we can only speculate that the tagline reads something like ‘What’s the perfect weight?’, leading us to believe the updated model will be lighter than the 1.07kg showing on the screen. Do help us out in the comments, if you’ve got a better translation. The current model features a 12.5-inch FullHD display, Intel Core m3-7Y30 or Core i5-7Y54 processors, 4GB of RAM and 128GB or 256GB of storage. It all comes in a sleek metal body, not unlike a certain Apple-branded laptop that goes by a similar name.